Find out more about the genre, people and generally everything you ever wanted to know. "1. A practical, sturdy, example of protective eyewear. 2. A blog and forum devoted to the lighter side of all things Steampunk." "Information for the Steampunk Community"
Steampunk society promoting and encouraging steampunk literature, crafting and discussion in Nova Scotia. A group for Newfoundlanders who are interested in steampunk and related genres such as teslapunk, dieselpunk, clockpunks and everything in between. Quebec Steampunk a besoin de votre support pour mieux faire connaitre le monde fantastique du Steampunk a travers la province - Steampunk Quebec needs your support to help spread the steam across the province. A place for all Steampunks in London, Ontario and the surrounding area. They are a closed Facebook group so you will have to ask to join. The Sterling Stars welcome you! They strive to support each other in steampunk with positive discussion and events. The blog is out of date, but their Facebook group is current. Local group for steampunks in the Sarnia, Ontario area. A local group for all steampunks in Thunder Bay and surrounding area. The blog is out of date, but their Facebook group is current. The City of Bridges Steampunk Society is an organization devoted to steampunk enthusiasts in and around the Saskatoon community. Great places to ask questions and learn more about steampunk. TeslaCon is, at its core, an immersion event. What this means is that attendees fully experience the story and time period throughout the convention over the three days they are attending. Various sites of steampunk goodness. The fabulous ruminations of Jaymee Goh. Mike Pershon lives in Edmonton and is doing his dissertation on Steampunk. "The purpose of this blog will be to create an online annotated bibliography of sorts for my research." This is the website of Nancy Overbury....In her words: In searching for like souls, she created Overbury Ink as an arena for her Steampunk tendencies. Here a home can be found for others who have an eye for the unusual, original and unique. Transforming a 1976 Boler trailer into a mobile Steampunk Refuge! Artists whose work is exemplary! Steampunk and Asian blended to perfection. Amusements for one and all! Spend hours dressing Alexia Tarabotti for day, night, tea, opera and fighting evil! 2D animation movie - coming soon! "The League of STEAM (Supernatural and Troublesome Ectoplasmic Apparition Management) is an organization comprised of Inventors, Scientists, Adventurers, Craftsmen, Monster and Creature Hunters, and Paranormal Researchers." Steampunk comics on the aethernet. It's steampunk, gothic, creepy and wonderful! The adventures of Lady Sabre and the Pirates of the Ineffable Aether. Carleton University student newspaper article. Interviews with Mike Perschon, Lee Ann Farruga and David Hardwick. Interview about steampunk jewellery for a Spanish jewellery blog. Our Historical and current inspirations. My article on Steampunks in Canada. Article on Steampunk in The Leveller October 2010 by Joe Hutt. You can find the article on page 15. 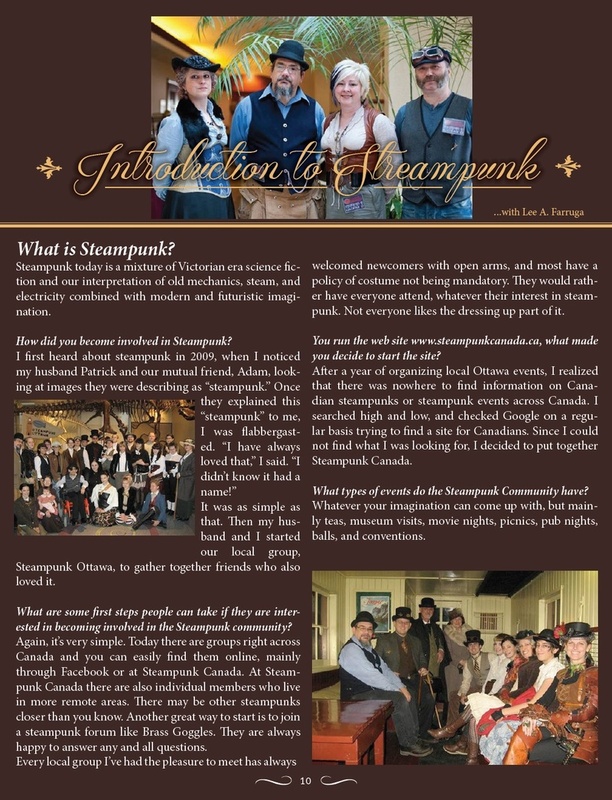 An article in Autumnplay 2010 on Steampunk decorating and an interview with Steampunk Canada's founder, Lee Ann Farruga. Photo credits missing: Interior photos on pages 41 and 42 and the photo on page 41 with the lamp and computer desk are the home of and items belonging to Bruce and Melanie Rosenbaum of "Steampunk House"